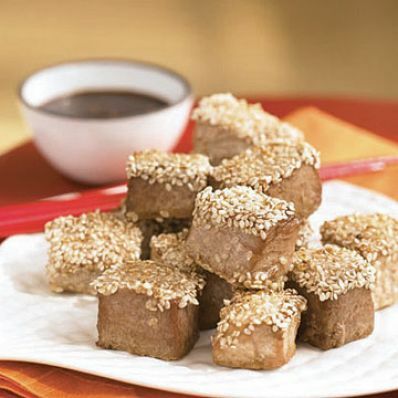 For an appetizer with Asian flair, try these cubes of fresh tuna coated with sesame seeds. Serve with toothpicks so guests can dip the flavorful morsels in the spicy dipping sauce. 2 of 2 Combine hoisin, teriyaki and lime juice. Arrange tuna pieces in a glass baking dish just large enough to hold them in a single layer. Brush with hoisin mixture; let stand 15 minutes at room temperature or refrigerate for 2 hours. 1 of 2 Combine hoisin, teriyaki sauce, line juice, ginger, sugar and hot pepper. Microwave on HIGH for 30 seconds to dissolve sugar. 2 of 2 To serve, sprinkle tuna with sesame seeds. Bake at 350 degrees F for 8 to 10 minutes or until firm. Serve with dipping sauce. Per Serving: 1 g Fat, total, 2 g carb., 0 g fiber, 2 g sat. fat, 129 mg chol., 35 kcal cal., 60 mg sodium, 5 g pro.